Cut into the cliffs under and around Cliffstable on Kerstal are a number of old dig sites where miners extracted emeralds for several years from twisting and confusing mines. 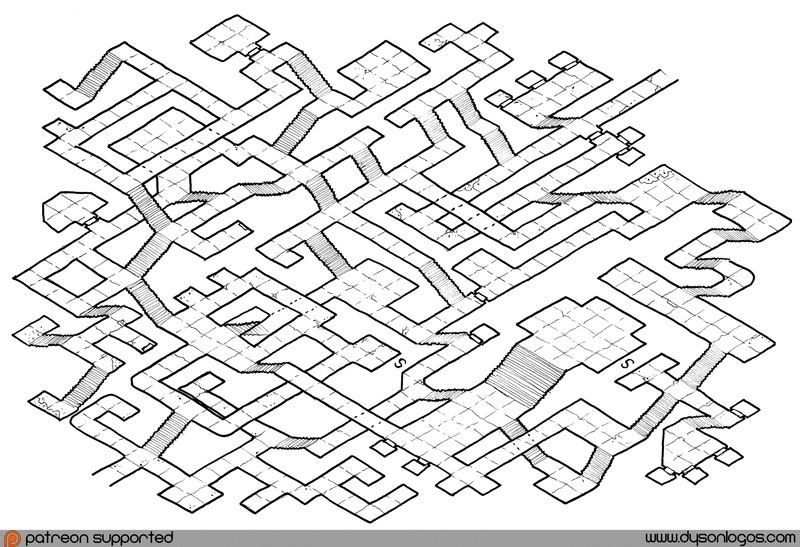 When the mines were played out some sections were converted into crypts, others into storage areas… and the Crowspine Mine was “upgraded” into the Crowspine Labyrinth by a clan of homesick dwarves who have not been seen in generations. No one even remembers the dwarves finishing the job or leaving the town; they just seem to have fallen off the historical record completely. The Crowspine Labyrinth is one of the now fabled portions of the Cliffstable Undercity, linking together the crypts under the north side of town with the mines converted into storage underneath Tower Hill. Normally when I draw an isometric map I include some hinting of the walls to show which way is up and which is down. Because the Crowspine Labyrinth is so convoluted, I didn’t have the room for them without making the whole thing even less readable. The downside of not having the walls is that I initially scanned this map (and released it to my patrons) upside down. And it still seemed to make SOME sense, except areas that should be over other areas were drawn under them, and so on. It took me 20 minutes to figure out that I didn’t make layer errors, but just had the whole map upside down.